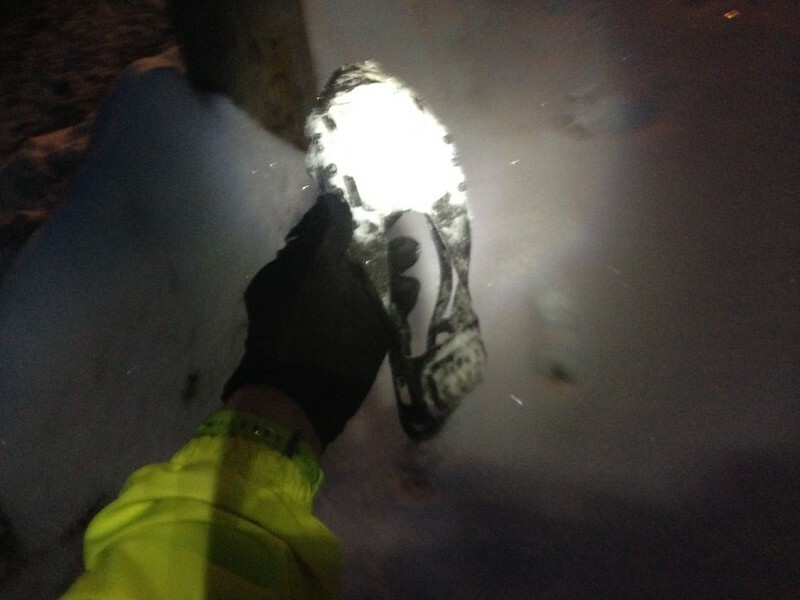 I’m not a stranger to running in the snow, but this year the weekly blizzards have kept me shoveling instead of running. And it’s been really cold. But I’m back now, and apparently my gear is all worn out. My jackets and shirts and things are okay, but my shoe spikes are apparently fed up with me and yearning for retirement. 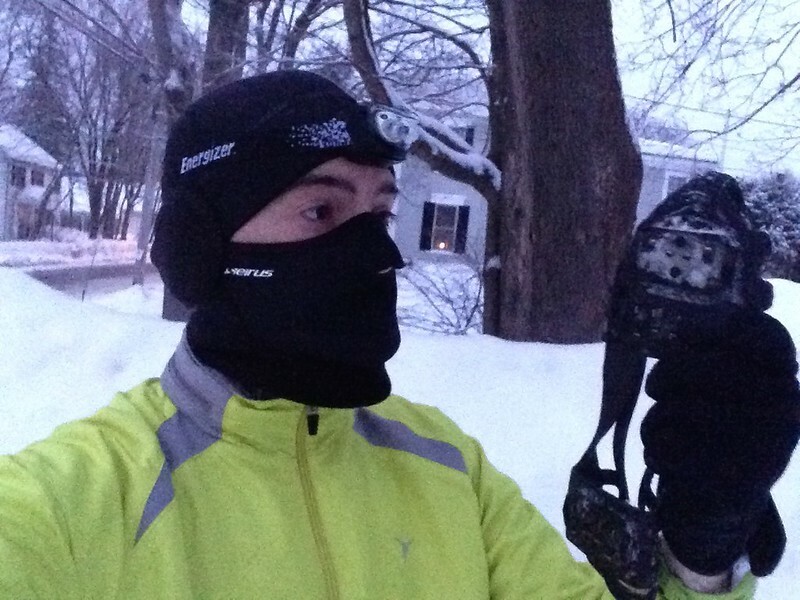 This morning’s temp was -10C/14F, which isn’t too bad if you wear the right stuff. I’m a little off my game, however, because I haven’t been out there lately and I’m in a new town. So instead of bold exciting goals, I decide to see how far the sidewalks go on my street going south. I would do a simple out-and-back which would probably round out to about 3.2km, or 2 miles. I could get back into pattern and maybe figure out what I should be wearing in those temps. I only found this one. The other is lost to the Winter Gods of Lost Stuff. Sadly, my rubber shoe spikes have stretched a bit. I didn’t even realize it when they flew off, because the terrain kept changing and the sidewalk was plowed better near my house than further down. I saw one in the snow on the way back, and realized that I hadn’t seen it on the way out. I checked my feet… yep, no more spikes. I had blamed the slipping on the thick snow, my own clumsiness and perhaps some sort of cruel vengance from the Snow Miser. It turned out to be simple wear and tear. And of course, the snow was lighter near my place, and there was less snow to cover whatever ice remains from previous days. So I had a slippy-slide adventure for the last quarter-mile. But I guess this stuff just happens. Things wear out, and are lost to the Elements. I brought the one I recovered home because I don’t want to litter, but the other one is lost in the snow somewhere. On the bright side, this is my opportunity to adopt a New England superstition: things that are thrown into snow banks are gone forever. They just disappear. Nevermind the spring thaw, just pretend that the stuff is gone.